Bryan Singer is 100% going to McG the X-men Days of Future Past movie. He recently tweeted that Evan Peters from American Horror Story has been cast as Quicksilver. 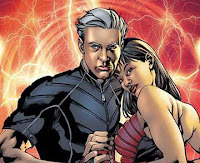 I am not sure how this will work with Joss Whedon damn near confirming Quicksilver and his sister, The Scarlet Witch, for some creepy familial relationshippery in the Avengers 2 film. Over on the wonderful site- The Mary Sue, there's an interesting small read about Scarlet Witch's casting. It has a rumor of Saoirse Ronan possibly being a contender for the role. She would be a hell of a fit, and I hope she gets the part. Would Peters be able to reprise his role in some intercompany crossover? I'm not entirely sure how the copyrighting works with some of the characters.